This bundle allows users of Infuse Pro 5 to upgrade to Infuse Pro 6 at a discounted price. 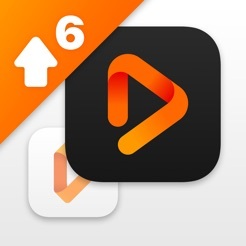 Alternatively, Infuse Pro 5 users can also receive a discount when purchasing a lifetime Pro license through the free Infuse 6 app (search for Infuse 6 in the App Store). Infuse Pro 6 requires iOS 9 or later. I had purchased infuse 4 and 5 pro. I loaded 5 shows via web browser prior to my trip and it asked if I wanted to upgrade movies and I clicked yes. Little did I know they replaced version four with version 6 on my device without my permission. Now I’m on the trip and cannot watch the shows. So I purchased the upgrade bundle which installs a new version. This is not how GoodReader handled their bundle. So now I’ve wasted $20 and still cannot watch my shows. So another 6 hours on return flights without video. I will be requesting a refund when I get home. I would like to learn how to file a complaint as I never authorized version 6 being installed on my device. If the authors can tell me how to watch the videos while on vacation I would be willing to change my position. Same thing on my 7plus. On my Apple TV and iPad the pro 6 installed okay but on my iphone it says I have to pay $24. Just showing purchased but no option to install. I also bought the upgrade to Infuse Pro 6, it installed fine on my iPhone 6s Plus and AppleTV but my iPad Air 2 shows it as “Purchased” with no option to install. Glad it’s on my AppleTV, that’s where I primarily use it.